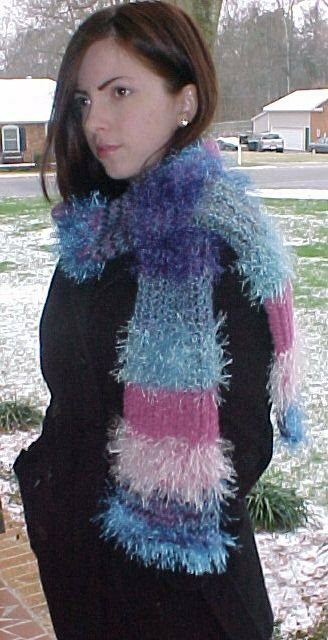 Every scarf is unique and I only have a few left of each character. I ship USPS Priority Mail for $7.70 to USA 48 states. 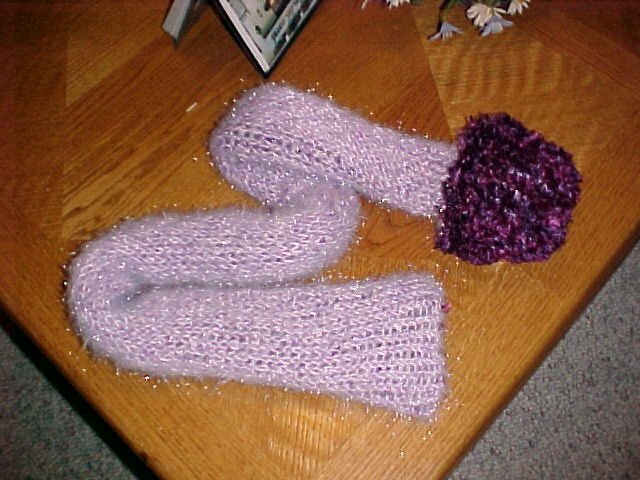 Remember to put in the comment section the scarf you want. Well, I have decided not to finish the braided scarf. Here is a picture of how it looks. Knifty Knitter brand of loom. I really like this method. It is very easy and works up very quickly. It also uses less yarn than knitting on a knitting board. So, this method would be best when using yarns with less yardage. 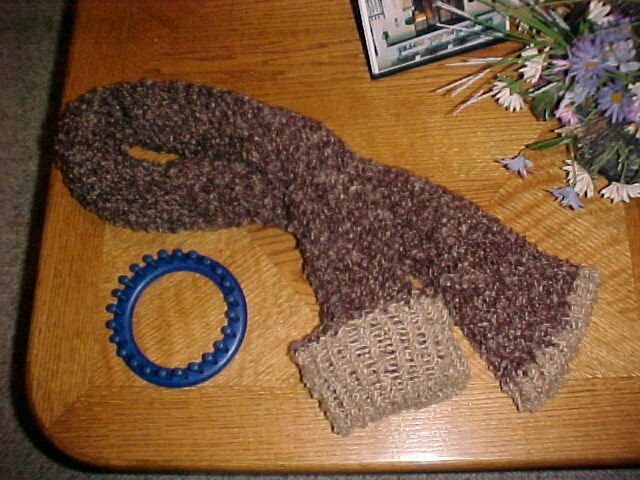 using Paton’s Bohemian yarn. 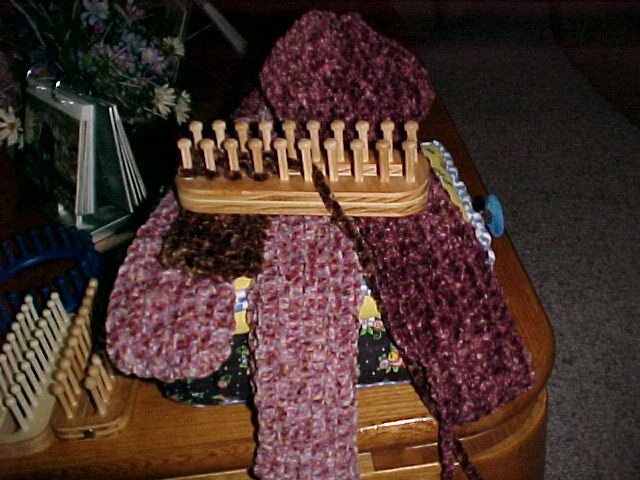 I am then going to braid them together, then place the ends back on the knitting board to knit a border of color on both ends. This is what I have done so far, just need to finish that last color. 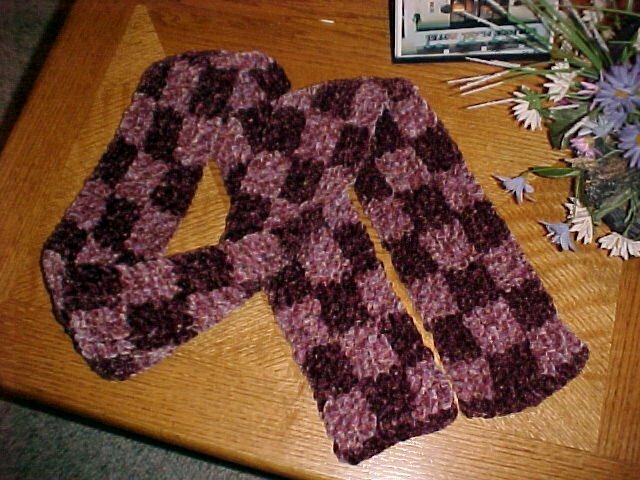 This next one is a checkerboard 60″ scarf. 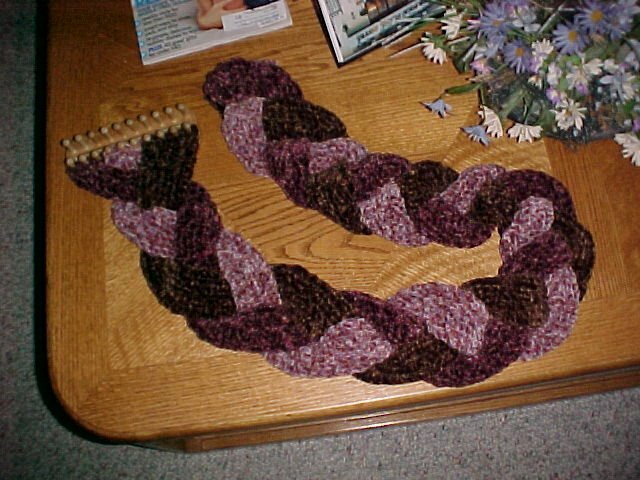 It is about 6″ wide and I used the Paton’s Bohemian yarn in 2 different colors. Last week I came up with a reversible scarf. Now, I know I am not the first one to think of this…but I think that they are pretty darn cute. In the photo’s below I turned up one end so you can see the second color of the scarf. The first one I made was a short one for a child. 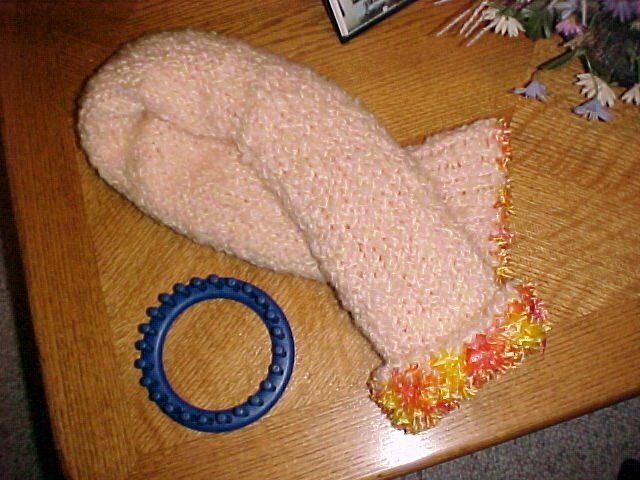 (didn’t have enough yarn to make it longer) I used Baby Cloud for one side and Bernat Boa for the other side. Whata ya think? Cute huh? These are 2 more reversible ones I’ve made this week. Last but not least, this is my favorite reversible. 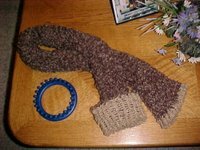 The reversible’s work best when you use 2 very thin yarns. 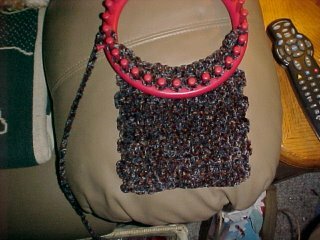 On this next one I used Bernat Boa and Paton’s Gllittalic which is so pretty and so soft, just the perfect yarn for this application. For a 60″ reversible it takes 2 skeins of each color. See how that Gllittalic just sparkles. Well that’s all for now…Have a blessed day! This is neat. Your own little chat room. Are you surprised that I actually looked at this one? LOL Have a good day! Hi and Welcome to my blog. 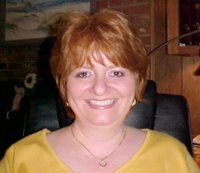 My name is Connie and I live in Mint Hill, North Carolina. I am a wife, mother, hairstylist and most importantly a crafter! I love crafts of all kinds, you name it I’ve tried it. 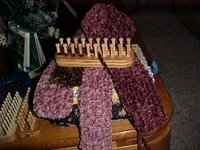 Lately however I have aquired a love of knitting boards and looms. Me, along with my mom and sister, have knitted over 200 scarf’s for 2 craft shows in November 2005. I have also started designing patterns for the knitting boards, because there is few and far between in my experience of searching them out. 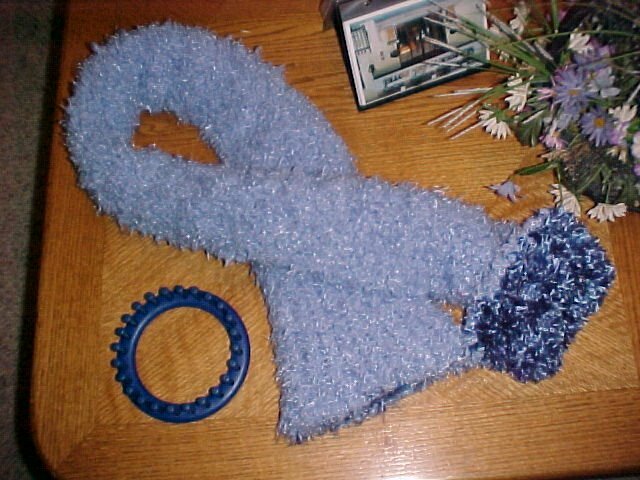 Most recently my character scarf’s seem to be very popular. I call them “Connie’s Little Characters”. I will soon have them for sale on my website… Bee Happy Gifts. 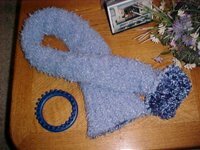 I already have the Santa pre-made scarf’s for sale, soon I will have the pattern for sale. I also have an Elf, Snowman, Rudolph and Christmas Mouse. Well, that’s all for now…back to my knitting!